SuperHosting Review 2019: Is SuperHosting a Good Hosting? SuperHosting is a super provider of dedicated server solutions as well as server housing and rack space in one of four Tier III data center facilities across Europe and North America. Although they are a pricier option, they make up for it with the sheer quality of their infrastructure and support. SuperHosting is a Czech hosting provider that’s been in the industry for over 13 years. They provide premium services to larger organizations and enterprises, from dedicated server packages to space for your server to be housed in one of their four world-class data centers located across Europe and the United States. You can also have your server fully managed by their dedicated technicians like over 1,000 of their other customers. They provide their service in Czech, Slovak, and English. 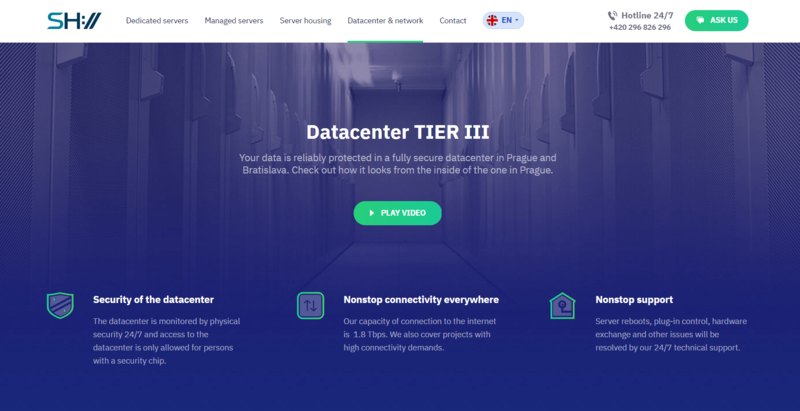 The star of the show at SuperHosting is undoubtedly their network of state-of-the-art Tier III data centers; this is also the reason that you should consider them in the first place. Their internet connection has a massive capacity of up to 1.8 Tbps, which allows them to provide up to 10 Gbps port speeds to their customers. Their top-of-the-line peering networks also ensure great performance across the globe with an average delivery time of 6ms. All routes are also backed up in N+1 mode and they can reroute traffic to another ISP within ten seconds in the rare event of any route failures. They also provide huge amounts of resources with their server packages, with up to two Octa-Core Intel Xeon CPUs and 128 GB of RAM for a single solution. Their 24/7 technicians also make sure everything is in top shape around the clock. SuperHosting only provides a variety of managed and unmanaged dedicated server rentals or housing packages, so it’s expected that there wouldn’t be a money back guarantee with such premium offerings. The closest thing that SuperHosting has to a free trial is to test out their dedicated servers at a moderately low flat rate for seven days. Their normal dedicated server packages are divided into two groups. The first group of plans all come with a single Intel Xeon Quad-Core processor, 32 or 64 GB of RAM, and a range of storage options with both HDD and SSD available.The other group of plans are for their double Octa-Core processors with up to 96 GB RAM. Monthly, quarterly, and semi-annual billing terms are available. Backups, extra mail storage, and firewalls are paid extras. There are also managed dedicated server options with a range of CPU, RAM, and storage configurations. The same billing options apply, but the addons above are included for free. Note that with these rates you’re also paying for more than two hours of administration per month. SuperHosting’s prices are quite expensive, even considering the fact that you are leasing top-of-the-line servers. They may not provide live chat technical support, but they make up for it with amazing 24/7 ticket and phone support. Every representative you come into contact with is a professional, which always reassures you that you’re in great hands. I’ve always had my queries quickly responded to and resolved without any hiccups. They also provide a very extensive FAQ as a self-help resource. Although you definitely pay for every bit of it, SuperHosting is still an incredibly professional and superior server hosting provider. Their Tier III data centers and outstanding technicians make them worth every penny. Wondering how SuperHosting stacks up against other Web Hosting companies? Enter any other Web Hosting company and we will give you a side-by-side comparison.